Winner Robert Rock with the trophy. Photo Eoin Clarke/www.golffile.ieRory McIlroy regained the world No 2 ranking from Lee Westwood when he finished runner-up to surprise winner Robert Rock in the Abu Dhabi HSBC Golf Championship. Englishman Rock, 34, sensibly took a penalty drop from a hazard at the last and had enough with a bogey six and a 70 to win by a stroke from McIlroy on 13 under par. Rock’s playing partner Tiger Woods could only manage a 72 and ended up tied for third with Dane Thomas Bjorn (68) and Northern Ireland’s Graeme McDowell (68), who had a hole-in-one at the 186-yard 12th. Gareth Maybin (71) shared 14th place on seven under with Padraig Harrington (73 10 shots behind Rock in 35th place on three under. McIlroy was taking positives from the seventh runner-up finish of his European Tour career and his third in his last six official starts but there’s doubt he will be wondering what might have been had he not been penalised two strokes on Friday for brushing sand off his line when putting from off the ninth green. Two strokes behind Rock and Woods starting the day, McIlroy found himself three behind the Englishman with nine holes to play after following birdies at the second and fifth with a bogey at the seventh to turn in one under. Robert Rock opted against playing this shot from the hazard at the 18th. Photo Fran Caffrey/www.golffile.ie He was just one behind with five to play when he birdied the 13th and Rock, playing in the match behind, bogeyed the hole. But the former driving range professional birdied the 14th and 16th to restore his cushion and could even afford a bogey at the last to win by one after McIlroy failed to a 10 footer for birdie at the 17th. McIlroy birdied the last, getting up and down with a wedge and an eight foot putt, to set the target at 12 under but he knew in his heart that his closing 69 was never going to be enough. “I couldn’t get any momentum going. it was par after par after par. When I birdied 13 and made a great up and down for par on 14, I thought I have a chance here. I was able to birdie one of the holes coming in but realistically, I needed another one. McIlroy has now finished fifth, third, second and second in his last four starts in Abu Dhabi. Rory McIlroy birdies the 18th to secure second place. Photo Eoin Clarke/www.golffile.ieWorld No 25 Woods, who needed to win to return to the top-10, matched Rock’s early birdies at the second and third but then bogeyed the next two holes and fell three behind with the Englishman birdied the sixth. The gap was just one through the turn, however, as Rock bogeyed the eighth and Woods birdied the ninth. But the former World No 1 bogeyed the par-five 10th and finished with eight straight pars as he struggled with his ball-striking. McDowell was pleased to finish third after a week that saw him lose two shots on Thursday when his driver broke in mid-shot and finish with some incredible slices of luck, including a hole in one and a lucky ricochet off a grandstand for birdie at the 18th. “It was a funny old week with my driver breaking on Thursday and the putter being cold on Friday and Saturday,” he said after his 68. “I’ve exceeded my expectations for the first week out and today was a little bit of a slow day and all of a sudden, I hole a seven-iron (for an ace on the par-three 12th], I chip in from over the back on 13 and have chances on 14 and 15 and 16. “And then I birdie 17 and hit the worst layup known to man on 18 and bomb my gap wedge over the back at the last, hit the grandstand, ricochets back to six feet for a regulation four. It was an unbelievably dramatic finish. McDowell finished on 11 under par and headed to the range in case of a play-off but it was not to be. McDowell’s prize for his hole-in-one at the 12th was an annual three-night stay at the luxurious Emirates Palace hotel for the rest of his life. While McDowell and McIlroy were pleased with their weeks, Padraig Harrington suffered another lost weekend as he closed with a 73 to finish 35th on three under. The Dubliner, just three off the lead at halfway, finished 48th for putts per green in regulation and 60th for putts per round as he trailed home 10 shots behind Rock. He may now need to win the AT&T National Pro-Am at Pebble Beach in two weeks if he is to have any chance of qualifying for the WGC-Accenture Match Play from February 22-26. Michael Hoey closed with a 72 to finish tied 48th on one under. His second European Tour International Schedule victory in his 227th European Tour event. Moved inside the top 60 in the Official World Golf Ranking from 117th. Was his first victory since the 2011 BMW Italian Open presented by CartaSi. Was his second consecutive European Tour season with a victory, following his triumph in Italy last season. The victory beat his previous best finish in the Abu Dhabi HSBC Golf Championship of tied 47th in 2009. He had shared the 54 hole lead with Tiger Woods. This meant both of his victories have occurred after him leading or sharing the lead going into the final round. He led by two in the 2011 BMW Italian Open presented by CartSi. Was his second consecutive top eight finish in a European Tour event staged in the Desert. Was eighth in the 2011 Dubai World Championship presented by DP World. Was the first English victory of the 2012 season. The win continued England’s record of winning at least once in every European Tour season since 1972. Was the 272nd English victory in European Tour history. 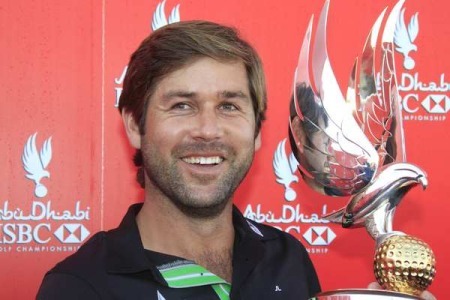 He joined join Paul Casey (2007 and 2009) as English winners of the Abu Dhabi HSBC Golf Championship. Extended his European Tour exemption until the end of 2014. Gained a place in the 2012 WGC – Bridgestone Invitational and 2012 WGC – HSBC Champions. Rory McIlroy might have made a slow start to 2015 but after going out in level par with one birdie and one bogey on his card, the world No 1 was inspired by a back nine wonder-shot as he stormed home in 31 to match pal Rickie Fowler in the Abu Dhabi HSBC Golf Championship. Rory McIlroy speaks to the media on the eve of the first round in Abu Dhabi. Picture Fran Caffrey/www.golffile.ieRory McIlroy will get a chance to see how his game stacks up against a fully fit Tiger Woods when he tees it up alongside the American and world No 1 Luke Donald in the first two rounds of the Abu Dhabi HSBC Golf Championship.